People are always finding ways to use everyday household products to make life just a little bit easier. Here are a few ways that aluminum foil can be used for things that you may never have thought of. Aluminum foil can make a great substitute for a grill brush! Just roll it up in a ball and scrub. Anything that can make ironing just a little bit easier and quicker is a great thing! 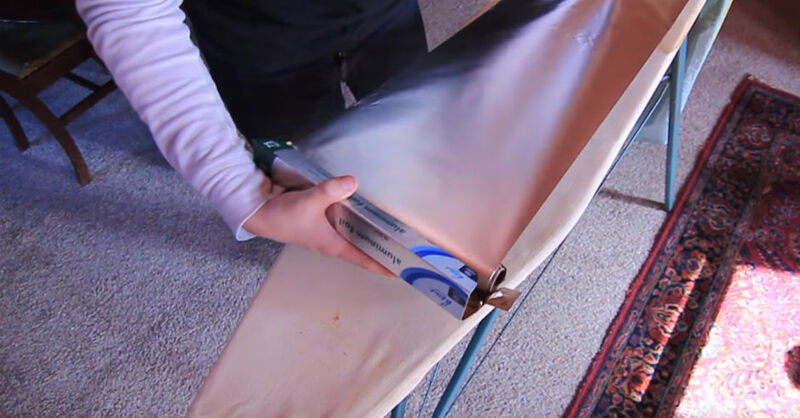 Take a long piece of aluminum foil and put it on top of your ironing board between the board and the cover. Now when you iron your clothes, the aluminum foil underneath will heat up and both sides will be done at the same time! Batteries. Who hasn't searched all over for the correct size of battery only to come out empty-handed? Well, if you happen to have one that's a little smaller, a wad of aluminum foil can be placed in the battery compartment to make up the difference. If you're moving furniture and having a hard time sliding it across your carpet, putting foil around the legs or feet of your furniture will make the move go a lot smoother. Love bacon, but not the mess? Make an aluminum foil bowl to pour the leftover bacon grease in when you're done. Once it cools and hardens, just throw it all away. Finally, you can use the foil to make a funnel. This is especially handy when a disposable one is preferable for things like automotive purposes. There they are six uses for aluminum foil. Be sure to check your local recycling centers for the best ways to dispose of your aluminum foil when you're done with it!